Add extra security to your home with these door reinforcers from Custom Service Hardware. Door reinforcements help prevent the door from splitting and bolts from breaking. Choose from a variety of finishes including stainless steel and antique brass or vintage bronze, and get the perfect matching door reinforcers. Door reinforcement adds an extra layer of protection to your home to keep your family and belongings safe. Door reinforcement plates maximize home security by helping prevent the door from splitting and bolts from breaking due to force. 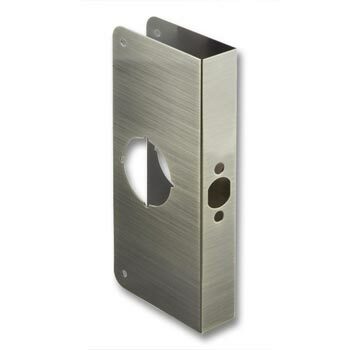 Custom Service Hardware offers a wide variety of architectural hardware, including door lock plates in beautiful finishes to match your doors perfectly. Our unique metal finishes include solid brass, antique brass, stainless steel, vintage bronze, and more. Shop CS Hardware now to make your home more secure.